• The Cost of sending an email message is very less. • The message are sent and receive instantly. • Email messages donot get loss data and reach to wrong party. 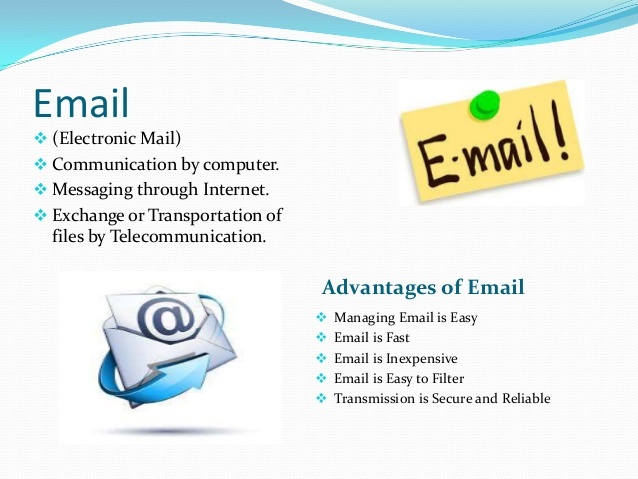 • Email always allows you to be in touch with your relatives who are staying far away. • We can attached pictures, videos, sounds to your email message and send it to anyone. We can read , print , forward , reply or delete the received message. • Emails may carry virus. These are small programs that harm your computer system. • Many people send unwanted emails to others . These are called spam mails . it takes a lot of time to filter out the unwanted emails from those that are reality important. 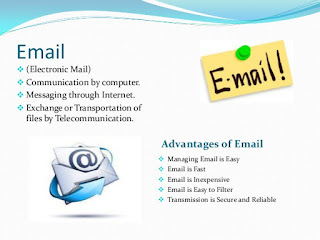 • Your mailbox may get flooded with emails after a certain time so you have to empty it from time to time.